Rosemary posted her “Exploration” on this subject the night of the New Moon in Cancer. As I do on the New Moons I cast an I Ching Gua – a six-line hexagram consisting of open, yin, and closed, yang lines. I posted my results and my interpretation of this I Ching divination on Monday this week (Link). The initial Gua I obtained was “Hardship” – it appeared that I may be in for some “problems” during the month (I use the I Ching to give me a sense of the incoming energies for the month ahead from New Moon to New Moon). When people seek solutions to problems, answers to questions, they do not realize that they are seeking help in making a change in their life. They want something outside themselves to change without changing anything in their interior life, and they want that one thing in their life to change without their having to change anything else in their life. one should turn inward and examine one’s own love. one should turn inward and examine one’s own politeness. one must turn inward and examine oneself in every point. The message is clear from both Mother Mary and the I Ching: if you want to solve a problem look inside yourself for the solution. How do you need to change your perspective? What do you need to change to be a solver? And the good news for this month is the “Hardship” doesn’t last! There is volatility in the I Ching and it changes to “Union.” I like that energy much better. It also suits the Cancer energy much better! Enjoy your month of “Union.” Enjoy your problem solving by questing inside for the changes, the appropriate responses, the new perspectives that lead through the lessons to the positive outcomes you desire and deserve! ROSEMARY’S INSPIRATION: Looking for Solutions? My “Two-Minute” Video for this Week: Looking for Solutions? ROSEMARY’S INSPIRATION: What’s Your Message? 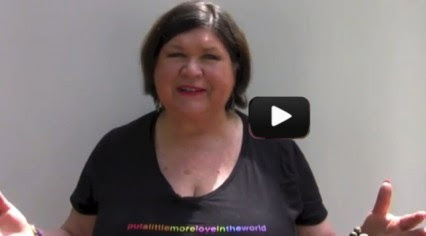 My “Two-Minute” Video for this Week: What’s Your Message? MUSE-INGS: Take out the Garbage! In my old computer programmer days [seems like centuries ago!] we used to say, ‘GIGO – Garbage In, Garbage Out’! Seems that’s what this message is all about. What we input into our internal database is what comes out in our life. So what are you putting in? When I work with clients who are accepting what others are trying to input it reminds me of the days when someone gave us ‘garbage’ to put in the database on the computer but expected a ‘garden’ to come out of it. That only works if the garbage is fertilizer and you also plant flowers! Your thoughts are your thoughts. Other people own their thoughts, too. But it’s up to you to decide which thoughts you will accept and store away in your database. Do you believe in your own self-worth or have you let someone else define that for you? For example, we women look at magazines and think that we must measure up [or down!] to what we see. But even those models say they don’t look like that either! Have you had a parent or spouse or friend tell you that being an entrepreneur is not wise because there’s no security in that? Not true! I’ve had several clients who have heard this in some form or other but today’s job market is not like it was decades ago. No one’s job is secure today. But if you are an entrepreneur you can make your own success, you can adjust your course, you can use the Law of Attraction to your benefit without being impeded by others. YOU have more options than someone who is not on their own. If you are in a job as an employee, you must still decide who YOU are because your job description does not define you! And look at your relationships to see if you are allowing others to input their ideas, thoughts, models of the world into your internal database. It’s pretty easy to let that happen. But they are not living your Life Purpose. It is not their responsibility to live out your mission on Planet Earth. Now look at what you regularly input into your own database. So often we read, digest, listen to ‘stuff’ that does not lift up our own internal vibration. We allow ourselves to be lowered to a frequency that does not resonate with our spirit and we can’t understand why we are feeling ‘down.’ It’s our internal vibratory frequency that is ‘down.’ That’s the clue that we must do something to lift our own vibration. Remember the Beach Boys’ song, ‘Good Vibrations’? [OK, maybe I’m the only one old enough to remember the Beach Boys!] Our internal mechanisms want us to feel good, to feel those ‘Good Vibrations.’ What are you doing today to feel a higher vibration than the day might bring on its own? As I write this I have had technical glitches with three client sessions – three! My whole morning. What was that all about? Now my choice is to rail against the Universe or the gods of cyberspace, or I can deal with each issue as it arises and move forward. I chose the latter path. We are always at choice about how to respond to what happens to us. But our options for those responses come from our own internal database. We must be careful to input only that which we would be happy to bring out as an option, a possible choice for us. This is why it is such a good idea to periodically clear out the database by clearing limiting beliefs, negative thoughts, blocks that we might not even know we have. Often times when I work with clients, this is the most important work we do. The rest of what they are looking for flows from this! You might also try the ‘nightly review’ where before you go to sleep you review your day, going backwards through the day to decide if, next time, there is a better choice for you to make in a certain situation. This instructs your Unconscious Mind to store the new choice as an option for next time instead of the old one. Take out the ‘garbage’ every night! We joke about hearing a voice so much that we label as insane anyone who says they hear a voice. But why is that so bad? Granted, there are some people who are not able to distinguish between their life and a myriad of voices that they hear and they do have a struggle with sanity. But sane people can be connected with other voices and can learn from the guidance available. I have a friend who suffered from Meniere’s Disease and had pain and ringing in her ears. It lasted for 7 years until she agreed that she would channel the guidance coming from a Muse named ‘Rose.’ The disease went away when she started sharing the messages she was receiving. She is sane and has been very helpful to a lot of people since that day. My granddaughter used to give people messages from their power animals when she was 5-6 years old. She was hearing what the animals wanted the person to know that day. She is now a happy, healthy teenager who wants to be a veterinarian. I could list a lot of people who have heard voices. Have you ever felt a voice inside that seems to be saying, ‘Call your friend’? And when you do, your friend says, ‘I was just thinking about you’? We’ve all had this experience. When faced with issues in our lives we often focus on the ‘Woe is me!’ thought instead of asking for and listening to guidance. And when faced with the proverbial blank page at the start of a creative project, who hasn’t wished they had The Muse standing in the room with them to drop the ideas into their head? Often when I work with clients, especially in the Mystic Transformation Days where we spend a whole day together delving into developing their roadmap through the next steps for them, the messages come through with new possibilities, new ways to view what is going on, new insights and tools and directions to follow. In that way, I can act as a Muse, an inspiration, reaching beyond the problems into other dimensions where the solutions dwell. Anyone who is willing can learn to reach into those solution spaces by allowing their thoughts to drift into ‘What if?’ territory. Staring at a blank page of paper doesn’t necessarily bring ideas with which to fill the paper, but relaxing one’s vision as one looks at the paper can allow an image to emerge that calls the person to become a scribe for The Muse. It is said that many geniuses took naps to find solutions to their problems. This allows the person to get out of their own way and to allow creative ideas to emerge. Contact your Muse while you sleep. Incubate the dream of your solution or the germ of your creative idea by simply asking, before you sleep, for your Muse to inspire you [and to help you remember the dream!]. Try living your life this week in the ‘What if?’ mode and see what possibilities your Muse shows you! And, if you get stuck, I’m happy to be Your Muse!